A dissident republican prisoner has lost a High Court battle over a policy banning access to solicitors’ mobile phone numbers. Nathan Hastings was challenging a prohibition aimed at preventing inmates from communicating with terrorist or criminal accomplices. But a judge rejected claims that the bar is irrational or a breach of his human rights. Hastings’ lawyers indicated they may now appeal the verdict. 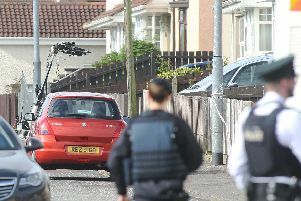 The 24-year-old, from Strandowen Drive in Londonderry, is serving a 10-year sentence for possessing guns, explosives and ammunition. Described as a “footsoldier” for dissident republicans, he was caught with the weapons during an undercover police operation in the city in 2013. He is currently being held within the separated regime at HMP Maghaberry. Proceedings were issued against the Northern Ireland Prison Service after he was prevented from adding the mobile telephone number of his solicitor, Fearghal Shiels of Madden and Finucane, to a permitted list. Hastings insisted that he wanted the number because he has frequently failed to reach Mr Shiels at his office. According to papers in the case the Prison Service’s position is based on mobile phones being insecure and capable of being lost or stolen. Potential risks to staff, inmates and the public were raised. The authority claimed it could enable criminal and/or terrorist elements to communicate with accomplices from within a prison, under inappropriate legal privilege, to organise, plan or carry out crime. Hastings’ legal team contended that the decision is illegal, irrational and unfair. Counsel also drew a contrast with the situation in England where, since 2001, inmates have faced no prohibition to phoning their solicitors’ mobiles. It was contended that the ban in Northern Ireland was “absurd”, given that prisoners in England can call their solicitors’ mobiles despite the high-level jihadist threat. However, Mrs Justice Keegan stressed that a policy operated in one part of the United Kingdom does not automatically apply to another region. She held that the challenge missed the point about Northern Ireland’s unique security situation. Insisting it was not a case of being denied legal advice, the judge instead described it as raising a convenience point. “I do not consider that the applicant has established a breach of Article 8 (of the European Convention on Human Rights), or that the governor’s decision making is irrational, illegal or unfair in relation to him,” Mrs Justice Keegan said. Outside court Mr Shiels expressed disappointment at the judgment, adding that an appeal will be considered.